Victoria Beckham played it safe when picking out her husband’s birthday gift this year and gave the already inked-up David Beckham something she knew he’d love – a voucher for a new tattoo. David already has 30+ tattoos scattered across his body – most of which were inked as tributes to his wife and children – but the soccer star shows no signs of slowing down, so the tattoo voucher seems like it was the perfect gift! “Not that he needs another tattoo,” Victoria admitted, but come on, what do you get a guy who already has it all?? Although David celebrated his 38th birthday back in May, Victoria only recently revealed her decision to give David a tattoo voucher to celebrate the big 3-8. That and some Ralph Lauren t-shirts, which he apparently loves. What a good wifey! According to David, his favorite tats are the ones dedicated to his wife and children, and his family is the reason he got inked in the first place. “I was talking to Mel B and her then-husband Jimmy Gulzar, and the subject of tattoos came up,” David explained in his autobiography. “I ended up going to this Dutch guy who’d done all of Jimmy’s. I’d finally realised what I wanted a tattoo to represent.” Since that ground-breaking realization, David Beckham has gone under the needle again and again, more often than not in honor of his family. 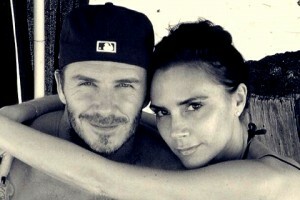 Now, with Victoria’s thoughtful gift, David Beckham’s tattoos may hit 33 sometime soon. Perhaps he’ll use the voucher to get that “romantic” anniversary tattoo we’ve been hearing so much about! Fan-bloody-tastic! Especially that they come in tattooed and narutal ;D Excellent quote too – one to print out in BIG. BOLD. LETTERS. and pin somewhere you can see it every day.